Fiam Italia is expected to solidify its presence around the world as one of its tables got a place in the “Collezione Permanente SaloneSatellite 20 anni.” The annual SaloneSatellite del Mobile in Milan turned 20 years old in November 2018 and the celebration included established brands turning in one-of-a-kind designs to be part of a permanent collection. In the case of Fiam Italia, that design was the glass table known as Kayo. The Kayo table is not necessarily a new design, but it definitely made a permanent mark so that it gained a place in the Collezione Permanente. 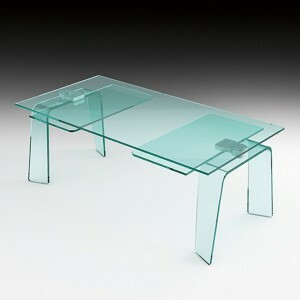 It is an extensible table with a 15 millimeter (mm) top in tempered glass. It is sleek, pure and while it looks delicate, is actually formidable. The independent extensions are in 12 mm tempered glass at 52 centimeters long each. The legs are detachable and are 19 mm thick. Such are in curved glass with a mechanism in brushed metal with a finish of either champagne or aluminum polish. It also has stainless steel plates. Designer Satyendra Pakhale created the table in 2015. The industrial designer has had works displayed around the world with permanent collections included at the Centre Georges Pompidou in Paris, France; Victoria and Albert Museum in London, UK; M+ in Hong Kong; Stedelijk Museum in Amsterdam, the Netherlands; Montreal Museum of Fine Arts in Montreal, Canada; and Museum für Angewandte Kunst in Germany, among others. Now one may add the Kayo table for the SaloneSatellite 20 Years Collection to the list. The latter is a collection of objects especially designed to celebrate the exhibition’s 20 years in the industry. Participants of the anniversary collection were designers who started their careers almost around the same time as SaloneSatellite. Pakhale started becoming active in the industrial design in 1993. Fiam Italia, on the other hand, was founded in 1973. Founder Vittorio Livi wanted to make glass a focal point in the world of design. Fiam is known as the first company to produce furniture in curved glass. Its products are displayed in around 25 museums around the world. The Kayo table was on display during the inauguration of the Collezione Permanente at the LegnoArredo Training Center in Lentate sul Seveso (Mb) in Milan, Italy. But soon enough, the 20th anniversary collection will be mobile, visiting museums around the world. For Fiam, this is a great way to solidify its presence in the international market. But for the future of the furniture industry, this is the perfect way to share ideas among furniture makers and designers. It is also a terrific way to inspire future craftsmen. Kayo is also in exceptional company as the 20th anniversary collection includes other iconic designs from credible furniture brands.